Well, i wasnt sure either. I broke them when I was trying to fit them towards the center I guess. I actually have disc-brakes so I hope that will be fine. Also, my gears were set up for 3 gears on the front and 8 in the rear if that is what you mean. THANK YOU very much for your response by the way. Your bike came with MTB integrated shifter/brake levers designed to work with V-brakes (aka linear pull brakes) or mechanical disk brakes. They have a 2:1 cable actuation ratio. The STI levers are designed to work with dual pivot side pull brakes and similar with a 4:1 cable actuation ratio. Thank you very much for your reply. How did you know what my bike set up was? Because I mentioned disc brakes? Sorry I am beyond Rookie and would like to one day be very knowledgeable in the cycling world like you. 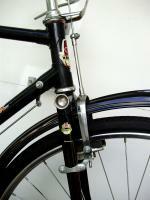 Also, those brake levers...are they compatible with the shimano st 2303's that I wanted? Also, just to be sure...those brake levers are another means of pressing the brakes from a different position right? "Your bike came with MTB integrated shifter/brake levers designed to work with V-brakes"
(06-09-2013, 04:53 PM)painkiller Wrote: "Your bike came with MTB integrated shifter/brake levers designed to work with V-brakes"
In addition, there are some models of the CX4 (OP's bike) equipped with V-brakes, and some with disc brakes, further increasing the probability that he has the more common longer cable travel mechanical disc brakes (same travel as V-brakes). Third stacking of the deck, it is Cannondale - the MTB company. Fourth, from Cannondale's website: "QUICK CX, Sport. Utility. On-road efficiency meets off-road ruggedness. The Quick CX's all-new mountain-bike inspired frame, 700c knobby tires, front suspension, and disk brakes make it the perfect vehicle for dirt road adventuring, off-road shortcuts through the park or all-weather commuting." Combined to make it highly likely that the OP's bike has MTB compatible discs. It is my understanding that the disc brakes themselves are designed for road/brifters and for MTb. The ideal mod for you would be to purchase Dics brakes for road use then they will work your the shifters you want to buy. I consider the cable helpers to be a "tacky"
"Cable actuated mechanical disc brake for use with linear pull brake levers"
Current disc are for MTB. (06-09-2013, 05:29 PM)painkiller Wrote: It is my understanding that the disc brakes themselves are designed for road/brifters and for MTb. The ideal mod for you would be to purchase Dics brakes for road use then they will work your the shifters you want to buy. I consider the cable helpers to be a "tacky"
We have come to an agreement for a recommendation. ha ha ha thats what I love most about you Nigel. That mechanical engineering just oozes from you, thats why we have to have Industrial Designers to keep things looking good ! The poor guy should have checked us out before he started ripping his bike apart. Thats just my feminine side that loves to spend other peoples money. I will meet you halfway, we a both certainly right now its up to him. sorry guys but would you be able to explain why I should buy road bike disc brakes? What would happen if I try to install the brake/shifters I want with my current disc brakes? Thanks again! (06-11-2013, 11:18 PM)Jeffrey Restrepo Wrote: sorry guys but would you be able to explain why I should buy road bike disc brakes? What would happen if I try to install the brake/shifters I want with my current disc brakes? Thanks again! ok Jeff, Nigel explained quite well with this fact:brake levers designed to work with V-brakes (aka linear pull brakes) or mechanical disk brakes. They have a 2:1 cable actuation ratio. 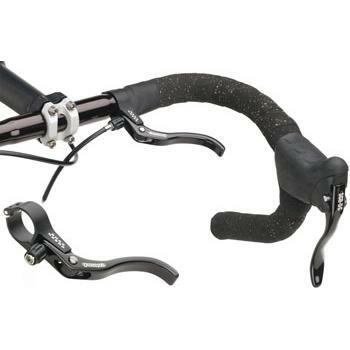 The STI levers are designed to work with dual pivot side pull brakes and similar with a 4:1 cable actuation ratio. actually, there is an excellent chance they would not stop the bike in a safe manner - for instance at a red light, you might find yourself 40 feet past your intended stopping point. Jeff, regarding your question, let me try a different approach to the answer. The STI levers only pull the brake cables half as much as your original brake levers pulled the brake cables. As there is always some dead space before the pads hit the discs (typically around ¼ of the lever travel), this means at best you might get one fourth the stopping power that you had with the original brake levers. You loose half from the difference in cable travel, and another half because of the dead space that takes up cable slack in the system.